Ice is on the move! This “AFTER” view shows how quickly the surrounding floodplain is draining back into the river. The the ice jam broke up, and the whole river started moving in a big (loud) way! I would estimate that the White River dropped over a foot in just about 10 minutes, while I was filming the ice-out event. 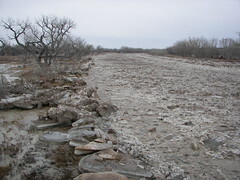 In this photo, the channel is clearly visible again.